Wagga Wagga is a proud city, and the largest regional city in New South Wales. It has unique features and differences that make it appealing to locals, visitors and businesses alike. It's these features that will enable Wagga Wagga to compete and succeed in attracting visitors and private and public investment over the coming years as the momentum of national growth continues to move away from the capital cities. Whilst perhaps lacking in some of the iconic symbols of other cities - no harbour bridge, no MCG, no seaside - careful analysis and consultation has revealed that Wagga Wagga's unassuming presence actually belies a depth and an array of appealing features. 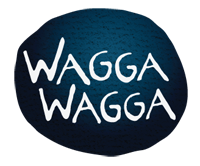 For those who take the time to experience these features, Wagga Wagga provides a vibrant, stable, progressive and endearing place to live, work, learn and play. If we have one truly iconic symbol then it is without doubt the name. 'Wagga Wagga' resonates with uniqueness and great meaning both in Australia and internationally. This symbol is the core of our brand identity which is designed to reflect what we are today, and represent where we want to be in the future. The system however, is more than a logo. It provides the evolution of 'good' beyond sports and is designed to promote investment and visitation. The new identity design itself consists of a flexible system of colours, typography, patterns, layouts, photographic style and a unique 'graphic circle' device. The system is designed to give a cohesive impression of Wagga Wagga whether we are promoting a local craft fair or investment proposal to State Government. Together, these elements capture the spirit, optimism and breadth of our appeal. Scratch the surface, and you'll find a mix of 'a hundred little good things' that can make everyday life even better - be it for business or for the family. These are the 'little things' that individually or in combination can make a good life great. And these are the things that Wagga Wagga has in spades. 'A HUNDRED LITTLE THINGS' is the creative foundation for the Wagga Wagga identity system. It's designed to highlight and celebrate the small things that make a big difference for locals, visitors or businesses in Wagga Wagga. As an optimistic, approachable and artistic city, Wagga Wagga has the opportunity to embrace a dynamic creative approach to communications. Our people and our environment are distinctive and it's essential that the authenticity of the people and place are captured. Supporting the photographic visuals are graphic elements such as the circular graphic pattern which reflects a sample of the 'hundred little good things', variety and diversity. Also reflected is the strong cyclic connections people have with Wagga Wagga - once they've lived in or visited Wagga Wagga, it's highly likely they'll return. This creative platform allows for unique stories to be told, from individual testimonials to new events or business expansion. It has a longevity that will be replenished as the 'little good things' continue to grow and flourish. The colour palette is inspired by the energy, warmth and beautiful colours of the natural landscape in and surrounding Wagga Wagga. Each of the colours is drawn from the landscape and when combined they create a vibrant palette of colours that can be highly distinctive in communications. Can I use the brand? To celebrate and promote Wagga Wagga local produce, artisans, and businesses, an application of registration for usage of the device must be applied via email: brand@wagga.nsw.gov.au where full terms and conditions will be made available. View examples of how the brand can be used in your business or your event.